If you like Mexican food and/or avocados, you'll be glad to learn that September 16 is the National Guacamole Day in the United States. Guacamole is a dip made of avocado that has been around since at least the 16th century. Guacamole was first made by the Aztecs in Mexico. It is extensively used in modern Mexican cuisine and has also become part of the cuisine of the United States. It can be used as a dip, condiment, or salad ingredient. 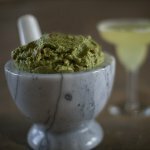 Guacamole is made by mashing ripe avocados and salt with the mortar and pestle. Lemon or lime juice is often added to keep guacamole from browning. Some recipes include cayenne or chili pepper, jalapeño, garlic, onion, basil, cilantro, tomato, and other ingredients. Guacamole is quite useful as avocado contains more than 20 vitamins and polyunsaturated fatty acids that reduce cholesterol. To celebrate the National Guacamole Day, try your hand at cooking this tasty and healthy dip. Slice 2 ripe avocados in halves and remove seeds. Spoon flesh into a bowl, add 2 finely chopped grape tomatoes, 1 finely chopped red onion, 1 finely chopped garlic clove, 1 tsp lime juice, and 1/4 tsp salt. Mash together with a fork, adjust seasonings to taste. Serve immediately with tortilla chips.